Washington D.C., September 20, 2018 – One of the objectives that brings Eco-Challenge 10.0, as part of the XIV edition of the Talent and Innovation Competition of the Americas (TIC Americas 2019), is to empower young people as promoters of innovative solutions for sustainable development. Eco-Challenge 10.0 supports young entrepreneurs in Latin America and the Caribbean, so that they have the tools to develop solutions that respond to local and regional contexts, and that later these solutions can be scaled up as sustainable businesses. The program is the result of an international partnership between PepsiCo, the Young Americas Business Trust (YABT) and the Organization of American States (OAS), which year after year has the support of a growing network of organizations from different sectors in the region; the program has become the engine of sustainable and inclusive economic growth. The call is open to citizens or legal residents of the United States, Latin America and the Caribbean, aged between 18 and 34 years. The teams will have the opportunity to compete for a prize of US $ 5,000, a scholarship to participate in the finals of TIC Americas 2019, among other incentives that make them the most outstanding young people in the continent due to their sustainable solutions. Propose solutions that allow increasing access to healthy,nutritious and adequate food and beverages, at accessible prices, that support positively the nutrition of low-income populations, especially those in rural areas. Propose solutions that respond to the fact that the relationship between food and people involves the protection of the environment, and the development of sustainable ways of producing and consuming food without having a negative impact on the environment. Propose solutions that reduce gender inequality. Especially, solutions that support access to the labor market for young people and women, and respond to the United Nations Sustainable Development Goals. The registered teams will have access to mentoring, virtual training and series of business resources and key contacts networks. 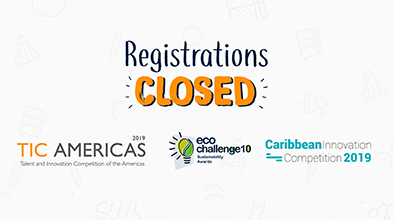 An international panel of judgeswill select the best proposals to compete in the finals of TIC Americas 2019 and Eco-Challenge 10.0, to be held in Colombia in the framework of the 49th General Assembly of the OAS. 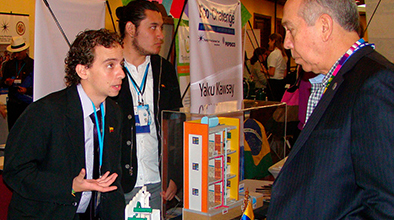 Since 2009, YABT, in partnership with PepsiCo Latin America Beverages, has incorporated the Eco-Challenge as the special category of environmental innovation within TIC Americas; thus, Eco-Challenge supports the development of business projects or ideas that promote sustainable development in the Western Hemisphere. To date, the Eco-Challenge has received 13,048 proposals submitted by 15,935 young people from 35 countries.